The baby’s due date is getting closer, and I’ve found myself in a tailspin of DIY projects for her room. One of the big projects I’ve worked on is an update of our changing table. It’s pretty basic – just a white changing table with dressers, with one side a little taller to make it easier to store diapers, wipes and all the lotions and potions that come along with diaper changes. 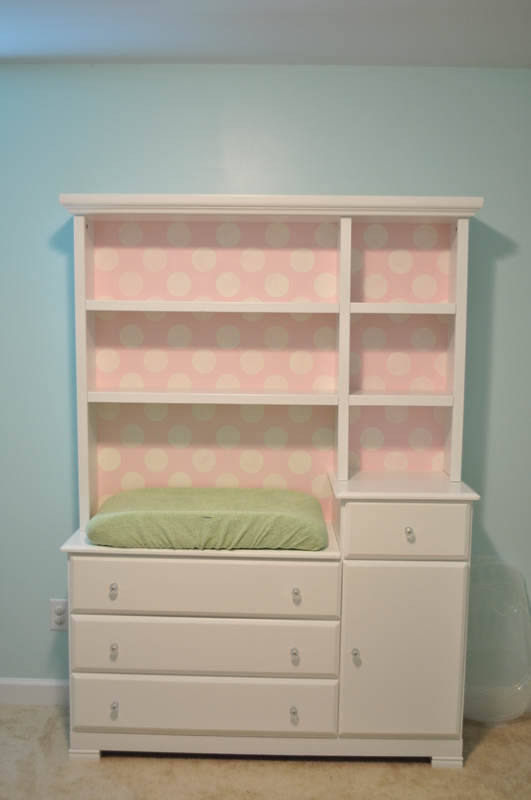 We opted for the hutch that goes over it to give the nursery some stature and extra storage. 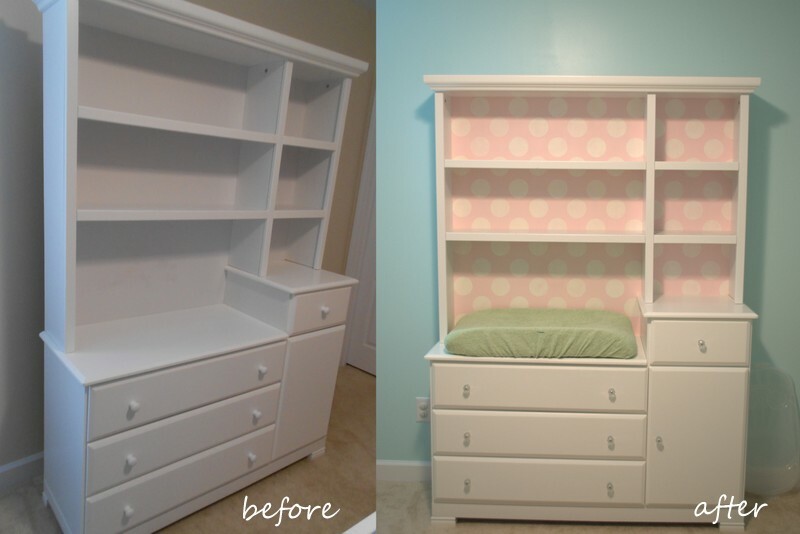 It worked great in our son’s nursery, but the back of the hutch got a little beat up. And it looked a little bland in a little girls’ room. So an update was in order. We took off the back, wich was really four pieces that screwed in. This was awesome because we didn’t have to pry off little nails, which would inevitably have ended up with cracked boards. Then I painted the boards in Behr’s Poetic Princess. I got one of those sample-size jars, and it worked really well. 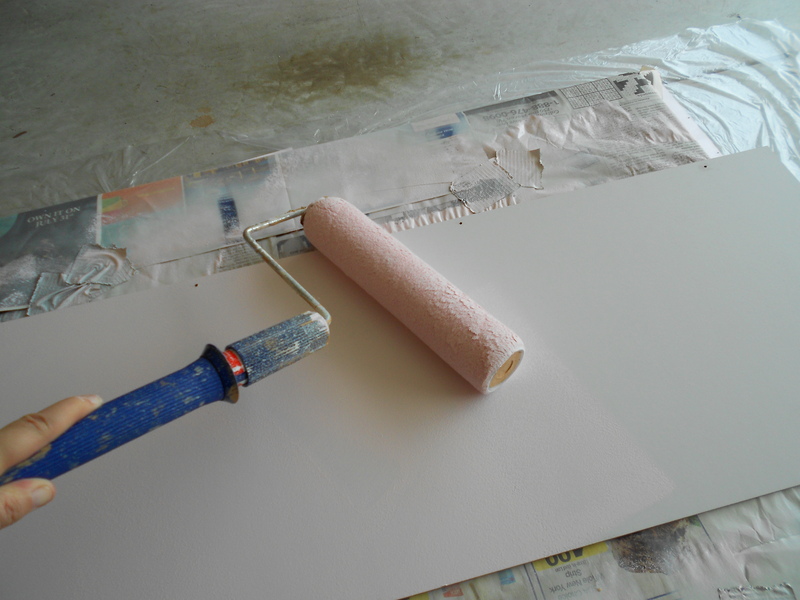 I used a regular roller, and I had just enough to finish two coats, but I think if I had used a foam brush or weenie roller it wouldn’t have soaked up as much paint and I would have had extra. 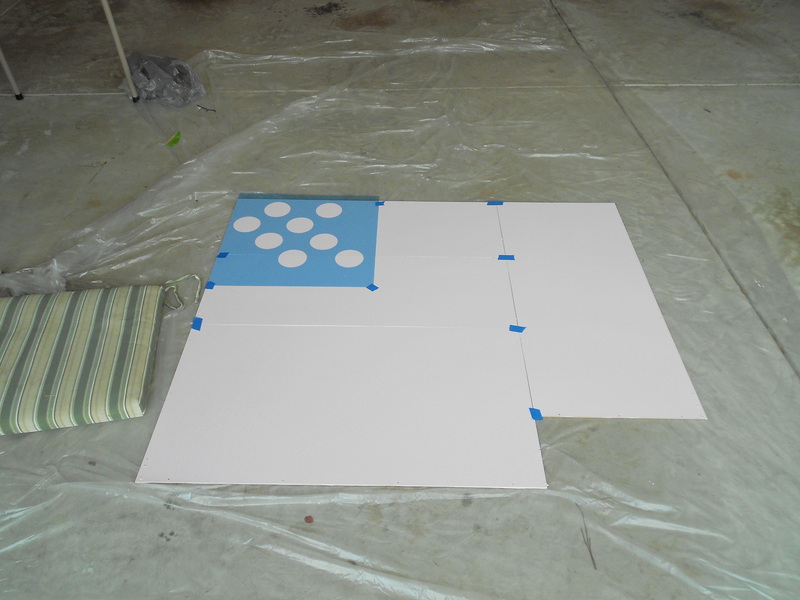 Next, I used a stencil and regular craft paint to paint a pattern of polka dots. I lined up all the boards on my garage floor so I’d have one continuous pattern and went to town. I did two coats of white paint using a tiny craft foam roller (about four inches? ), which didn’t completely cover it, but I liked it that way…kind of softer and obvious that it’s DIY, and not printed/factory made. The last step was to seal it. I wanted a little protection and sheen (the paints I used were flat and looked boring). I tried a spray sealer, but it looked horrible and stripey, despite doing light coats. So I went over it with clear polyurethane and a foam brush and it worked really well. You can still see my spraying faux pas if you look at it at the right angle and in the right light, but I’m not going to worry too much about it. Once everything was dry, we screwed back the pieces onto the hutch and changed out the boring white knobs for simple acrylic ones to give the room a little sparkle. I still need to dress it up, but you can get a look at how it’s all shaping up. This entry was posted in crafts, diy and tagged diy, nursery, nursery decor on September 27, 2012 by aliciamariel. I love this Alicia, I am trying it for my daughter’s bookshelf. Such a great idea. Hope you are doing well. I love this unit! Where did you purchase it? Hmm…good question. It was such a long time ago that I’m not sure I remember. I got it online either on Babies R Us or a baby furniture store that I can’t remember. It’s Da Vinci brand, Kalani collection in white. It’s good stuff. We’re on our second child and it’s strong as the first day we put it together with our first baby.